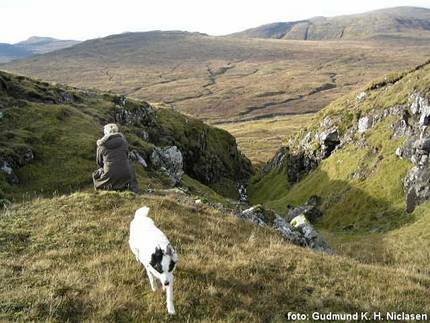 In this article Gudmund tells about his life as a shepherd. Gudmund himself has taken all the pictures. One word, “fjeldgang”, comes again and again. In Gudmund´s world every season has its fjeldgang. ”, ( that is to gather the sheep together in a fold app. 4-5 times a year). 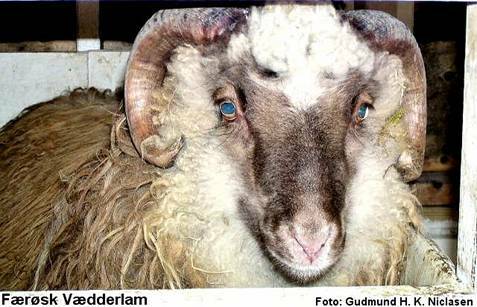 The Faroese sheep is described on Gudmunds web page . Here the specialist comes forward. Visit this unique web page where the Faroese sheep comes forward in an almost endless colour scale and pattern, and almost all with an ancient Faroese name! 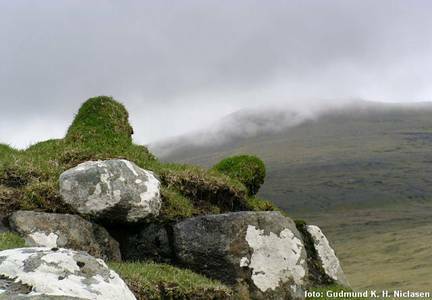 From ancient time the Faroese sheep have been out in the mountains all year around, having to find their own food. It can wary a lot from year to year, all depending on a cold or hot summer. It also matters a lot at what time the grass begins to grow. Sometimes it can be bold in late June, and as the lambing mostly happens in April/May, it can be of most importance for both quantity and size of the lambs. 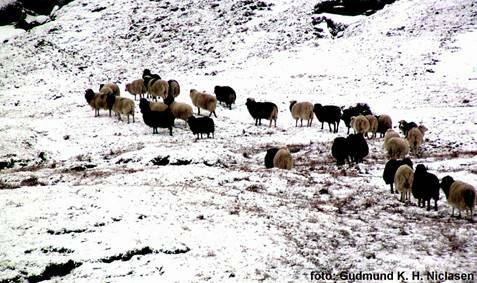 The winter also has a big influence on how the condition of the sheep is when the spring comes. It is not common to feed the sheep, but in these days the large owners are beginning to modernise their sheep farming. From ancient time inheritance gradually has made the sheep farmers to very small farmers. But nowadays they have tried to put sheep farming together, so that these gradually can be profitable. But everyone is not interested in this, as it is very good here on the islands to have a share in a plot. The land and mountain that belongs to a village is divided into plots with one or more owners – but mostly with several bigger or smaller owners. The shares are after the old measurement: “mark”, “gylden” and “skind” – 1 mark equals 16 gylden and 1 gylden equals 20 skind. The plots here on Vagar are around 2 to 8 mark. It varies a lot how many sheep are on a mark, from about 50 to less than 30. It is decided how many mother sheep belong to a “hauge”. This quantity has shown to be the best to get the best from the flock. Still it is common that hauger experiment with more or less. But when the winter, as told before, can be very different from year to year, it can only be luck to put too many sheep out. Usually they say that it is the winter that decides how many mother sheep, you can have in a “hauge”. The haugerne are also different in the way that they have good and less good winter hauger. A good winter hauge has a bigger, not too steep a piece, at the bottom of the mountain, where the sheep can be in the wintertime, as there is snow further up in the mountains. To look after the sheep, there has to be at least one shepherd chosen, according to the “Haugeloven” from 1937. 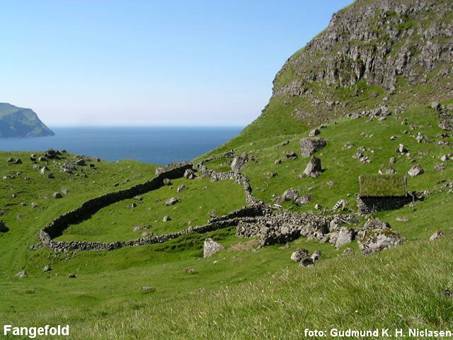 (Law of the plots) There has been a law on sheep farming on the Faroe Islands since the famous (Seydabrævid*) The Sheep Letter 24/6 – 1298. The shepherd’s task, is according to the same law, to take care of the sheep farming, “fjellgangen”, (that is to gather the sheep together in a fold app. 4-5 times a year) and ear tag the lamb. Also he has to take care of everything else in the spot “haugen”. He also has to ensure that the number of mother sheep stays the same and that the sheep stay within their “hauge”. 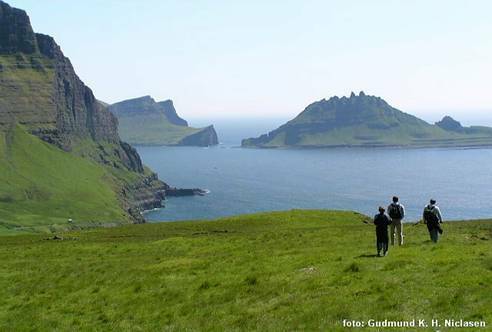 It has not been common to fence the “haugerne” on the Faroe Islands, but they have started to do so several places. The shepherds year starts after the rams have gone home, they are not out the whole year round, but are taken inside end of Jan. beginning of Feb. To ensure that the lambing doesn’t happen to early in the year, they let the male-lambs and the rams out in the “hauge” on Dec. 12th. The lambing then starts the second week in May. The reason that Dec. 12th. was chosen is to avoid sleet, which always happens in the beginning of May. As told the winters can be very different form each other. Sometimes the temperature can be 8 to 10 degrees Celsius through Dec. Without snow or minus degrees. But of course it can also be totally opposite. January, February and March are calculated to be the coldest of the winter months. The good winters the sheep walk high up in the mountains, if there is not any snow up there. But the more snow there is, the further down the sheep come. The shepherd’s job in the winter time is mostly to see that all the sheep are down from the mountain and are ok. It sometimes happens that sheep can be snowed in, and then you have to go out to look for them. It also happens that the sheep freeze to the ground, if it has been wet when they laid down, and then it has frozen through the night. It is different from “hauge” to “hauge” how much feed is given in the wintertime. It depends on the owner, the placement and the attitude to the sheep farming. The ownership can either be “feli” joint property, or “kenning” – that is that every owner knows which sheep he owns). A mixture of these ways also appear. Owners who have ”kenning” usually keep their sheep at home in the wintertime, either inside or in a fold. These owners usually feed their sheep through the whole winter and let the sheep lamb before they are let loose in the “haugen” after May 14th. In our “hauge” which I and another farmer keep, the ownership is “fælleseje”. There are 12 owners who have shares from app. 1 mark and down to 16 skind. The “hauge” is app. 6 km from the village, it is .500 ha. and is on a 574m high mountain. The “hauge” is in the middle of the island and therefore has no connection to the beach. The flock only counts 162 sheep, because of a very small winter “hauge”. Another “hauge” of the same size here on the island has 235 sheep. The “hauge” is run in the old way, where the sheep are out all year round and are only feed if it has been snow for some time. The first gathering is 2-3 weeks before lambing, where all the sheep are vaccinated for “blódsótt” (Clostridial diseases) and “brádsótt” (Dysentery). At the same time they are given medicine for worm in intestines and lungs. The shepherd tells the owners about the gathering and how many men he has to use this time. An owner who owns 1 mark has to have about 3 men each time, as to one who has 16 gylden only has to be there every 6-7th time. We are always 12 men at every gathering. If the weather is good without snow in the last half of April, we do not have to go all the way to the top of the mountain. If there is snow it is easier, because then the sheep are further down the mountain. The first lamb can come on May 6th and we hope it is over sleeting. As told before, the last sleet usually comes first in May. It even has a name, that referrers to the lambing - “lambasprænur”. About May we say that it is cold but dry and that should be good for the lambing. Even though it would be better if there were a little heat in the air, then the grass could start to grow and the sheep would produce more milk. The sheep do not have any problems around lambing, and we only go in the “hauge” to see how far the lambing has come. It also happens that the lamb fall down into ditches and cannot come back up. I have been a shepherd since 1978, but I have never had to help with the lambing. The foaling usually is over in the end of May or into June sometimes. We have also experienced that sheep have had lamb in the end of June. On the Faroe Islands most of the sheep get one lamb, but the smaller the group is the more sheep get 2 lambs. The reason that there only is 1 lamb pr. sheep is without a doubt that we feed them as little as possible. The reason that we do not feed them so much, is partly to strengthen the herd so that it better gets through the winter. It usually shows that if you have to take a sheep home for the winter, it has a hard time getting through the next winter outside. Another reason that the sheep are not fed so much is so that they do not lay in the lower part of the lower hauge by the houses, but have to go way up the mountain to get food. Finally a “hauge” with so many owners has difficulty finding shepherds who can take so much care of the sheep, because they all have a full time job, and here for the care has to be as easy as possible. In a “hauge” with several owners everything is butchered for the owners themselves, but owners with hundreds of sheep usually sell the meat. The second gathering is from the first to the third week in July, where the sheep are cut and the lamb are ear tagged. The cutting is mostly with wool scissors. Even though many have started to cut with electrical scissors, but as a lot of the “hauges” are far away from civilisation, it is not possible to get electricity. Here on this island, many of the “hauges” do not even have a road connection. It has been hard and sometimes impossible to sell the wool. To know/recognise our lamb and sheep from the neighbours and other “hauger” there is an agreement with the ear tags, so that one always can see which “hauge” a sheep comes from. It often happens that one of the neighbour sheep has come into the fold. As all the lam in the fold at this point are without ear tag the neighbours lamb will also be tagged with our ear tag, if you are not absolutely sure which lamb is the neighbours. A piece of wool in a contrast colour will therefore be hung around the neck on the mother sheep. The neighbour will be informed, so that he together with us, can keep an eye on what the lamb looks like, so that he can get the right lamb in time. Between this and the second gathering the shepherd has to find those sheep which of some reason din not get into the fold, so that he can recognise the lamb belonging to these sheep, as they are not ear tagged, and make sure that they get into the fold the next time. Then all the lambs are vaccinated against “blódsótt” and “brádsótt” as given medicine for worm in intestines and lungs. The mother sheep and rams are also given this medicine. 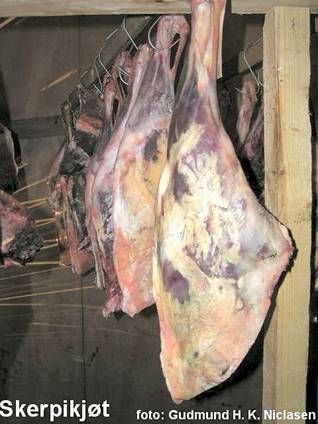 If there are sheep that do not have lamb, a mark is hung around their neck and they are butchered in October. Now comes a time where the sheep which have lamb are high up in the mountain. The Faroese sheep have the quality to be in groups. It means that every group stays together through the whole year. In our “hauge” there are 4 groups. In the summertime they spread a lot, but are always in the same area in the “hauge”. In the winter they gather more and come further down the mountain. In every group there can also be smaller groups. The shepherds job at this point and the whole year for that matter, is to keep the sheep inside the “hauges” boundaries. It usually in not so hard, when we by chasing them back every time we see them in the neighbours ”hauge”, have got a good feeling of where they belong. It usually is enough to show oneself, and then they go back, especially if you have a dog by your side. The first or second week in October there is gathering again, here all the mail-lambs and many ewe-lambs, except of those who have to replace the old mother sheep, which are butchered due to their age, are taken home for butchering. The best mail-lambs without defects are chosen for breeding. The owners have a duty to keep these mail-lambs home and feed them well, until they will go out to mate. All sheep, that are butchered, are weighed alive and first divided between the 5 mark and then, if there are several owners in a mark, divided between the owners compared to their share. There is not any butcher for sheep, so every owner butchers his own sheep. At this gathering nothing else is done, than the marking of the ewe-lambs, who are let loose again. Because between these gatherings the shepherd goes in the mountain and checks if these ewe-lambs, who were let loose again belong to the groups where the old female sheep, that are butchered, belong. There are always let more ewe-lambs loose than there is need for. The left over are butchered at the next gathering. Between this and the next gathering it is a busy time for the shepherds, they have to butcher the sheep they have got, and go up the mountain to note the lamb, that are to replace the old, who are butchered. To get as good a flock as possible, all 7-year-old mother sheep are butchered, and new ones put in. It is possible to have them longer, but 7 years has shown to give the best results. One to 2 weeks after the first butchering, we go after the old female sheep and the left over ewe-lambs. These sheep are also weighed alive and divided after ownership. Those ewe-lambs who are to replace the old sheep are vaccinated against “garnasótt” ( Paratuberkulosis) and “brádsótt/blódsótt”. All sheep and lamb get medicine against worms and leaches. Ear tags in plastic with the year is put on one ear, When all sheep who shall be butchered are taken, the flock should be the decided number 162. But as told before, you can regulate the number a little up and down. In our “hauge” we have tried to have up to 175 mother sheep, but have found out, that 158 to 160 gives the best results for us. Dec. 12th the mail-rams and eventually the rams are let loose into the “hauge” to mate the sheep. They are taken back in again in the end of Jan. And delivered to the owners. When this is done the year of sheep farming is considered finished. 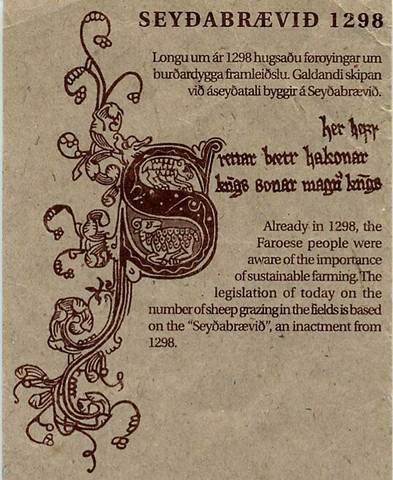 * The Seydabrævid, (The Sheep letter) which is a unique historical document, will appear later this spring (2006) on sheep-isle.